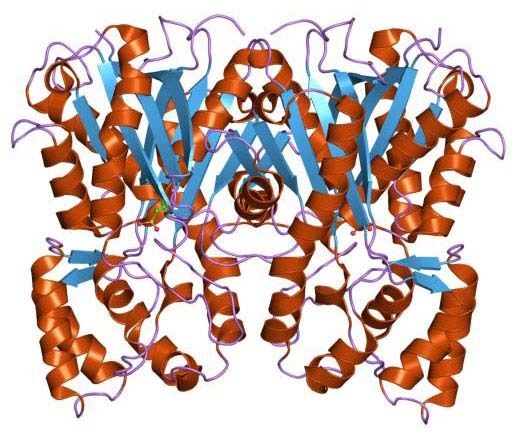 Polyketide synthases, also known as PKSs, are a family of enzyme complexes that produce a large class of secondary metabolites known as polyketides which possess pharmacologically important properties including antibiotic, antifungal, antitumor and immunosuppressive activities. PKS includes type I, II, and III(Austin and Noel, 2003). Among this, the type III polyketide synthases are responsible for the synthesis of polyketides such as chalcone and stilbene. In addition to the CHSs, the PKS super family also includes functionally divergent members like 2-pyrone synthase, Phloroisovalerophenone synthase, Trihydroxybenzophenone synthase, Acridone synthase, Stilbene synthase, Pentaketide chromone synthase, Octaketide synthase, resveratrol synthase, Benzalacetone synthase, Aloesone synthase and stilbenecarboxylate synthase(Austin and Noel, 2003; Schroder, 1997). Type III polyketide synthases are small homodimeric proteins of approximately 40- 45 kDa, and their derivatives possess chemopreventive activity against certain diseases(Jang et al.,1997; Clement et al.,1998). As the volume of polyketide data is increasing data by day, a platform including all details will help the researchers to find out all available data with out much time consumption. Austin, M.B., and Noel, J.P. (2003). The chalcone synthase superfamily of type III polyketide synthases. Nat. Prod. Rep. 20:79–110. Clement, M.V., Hirpara, J.L., Chawdhury, S.H. and Pervaiz, S. (1998). Chemopreventive Agent Resveratrol, a Natural Product Derived From Grapes, Triggers CD95 Signaling-Dependent Apoptosis in Human Tumor Cells. Blood, 92(3): 996-1002. Jang, M., Cai, L., Udeani, G.O., Slowing, K.V., Thomas, C.F., Beecher, C.W., Fong, H.H., Farnsworth, N.R., Kinghorn, A.D., Mehta, R.G., Moon, R.C. and Pezzuto, J.M. (1997). Cancer chemopreventive activity of resveratrol, a natural product derived from grapes. Science 275(5297): 218-220. Copyright@2009 Plant Molecular Biology, RGCB.